I recently tried to ship an old MacBook Pro and iPhone to my sister in the U.S. We took them to the post office, paid 8,000 yen, and went on our merry way. A postal worker called us later to say that they couldn't ship the items as they contain lithium ion batteries, which fall under the "dangerous goods" category. We asked about shipping by sea, but were told this was not an option. This then led to researching various other options for shipping these items abroad, although in the end, the cheapest option is to ship just the laptop without the battery in it (it's dead, anyway). 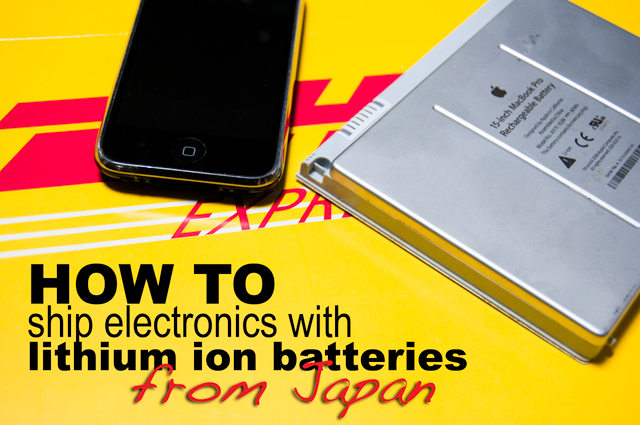 However, we also discovered that although Japan Post says you can't ship electronics with lithium ion batteries overseas, another pdf on their site says that you CAN ship some electronics with lithium ion batteries, but only to certain countries, and only by sea (surface) mail (船便, ふなびん, funabin). Of course, the U.S. is not one of them (which would explain why we couldn't send the laptop and cell phone), but Canada, England, the Philippines, Singapore, South Africa and several other countries are. You can find the pdf here, although it's all in Japanese. Also, you can send the tiny little wristwatch batteries by airmail through Japan Post. So what are some other possible options for shipping your lithium-ion-battery-containing electronics from Japan? FedEx will ship lithium ion batteries, although there are specifications for whether they are contained within electronics, separate but packed with equipment, or shipped alone. For those contained within the electronics, I was told there are no special packaging requirements (I packaged the items in the materials they came in), and that there are several forms to fill out. I had to fill out a "航空貨物安全宣言書 兼 爆発物検査承諾書" or "Air Shipment Security Declaration and Explosives Inspection Consent" form. In my case, as I was shipping to the US from Japan, I also had to fill out a Commercial Invoice and a "Statement Regarding the Importation of Radio Frequency Devices Capable of Causing Harmful Interference" or "FCC" form. If you ship via FedEx and are sending to a country other than the U.S., you should contact FedEx directly to inquire about any necessary forms for the country you're sending to. You'll also need to fill out the Air Way Bill (which you receive when you ship the box) - I was told to write "Lithium Ion Batteries not restricted as per PI967"on the Air Way Bill. Just for reference, I was told it would cost between 20,000 and 30,000 yen to ship the laptop from Shizuoka, Japan to Hawaii. Their Customer Service page can be found here. DHL said no special packaging is required for batteries contained in electronics, but each box can only contain one item (so a laptop and cell phone would need to be packaged separately). A commercial invoice and Air Way Bill would also be required, but they said an FCC form would not be required on my end (but could be required from the recipient). You can find detailed policy information and instructions for DHL here. The price to ship the laptop from Shizuoka, Japan to Hawaii was similar to FedEx, between 20,000 and 30,000 yen. You can get more information and a rate and time quote by visiting the DHL Japan site. Their Contact page can be found here. I contacted UPS as well, but they only ship lithium ion batteries for those who have contracts with their company. Yamato's website states they do not ship lithium ion batteries. If you know of any other possible resources, please let us know!